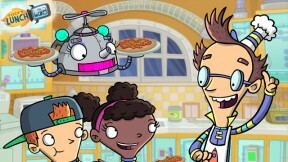 Fizzy's Lunch Lab is a vibrant, fun and kid-friendly web-only series featuring original characters and funny stories that entertain and educate families about the importance of good nutrition, a balanced diet, and physical activity. Join Professor Fizzy and his friends in the super-charged Lunch Lab Test Kitchen, as they prepare healthy snacks, investigate the difference between good and bad food, and learn what happens once the food you eat goes into your body. Each week, The Lunch Lab web site will release a new animated short video as well as a corresponding recipe for kids and parents to enjoy. Monthly food/nutrition themes will help guide the program's message, and the animated videos will reinforce concepts pertaining to the featured theme. This will make it easy for parents to extend the learning into the home.